This kind of dish is a staple of South Indian cuisine. Straightforward and quick to make, it will also add a vegetarian option to your repertoire. I have worked on the textures by roasting off the squash which gives it a crispy and sweet feel, not mushy like when you cook it in the coconut milk. The cashews also add a big crunch to the curry. Here we also have a solid introduction to the basis of Asian curries which is the paste. 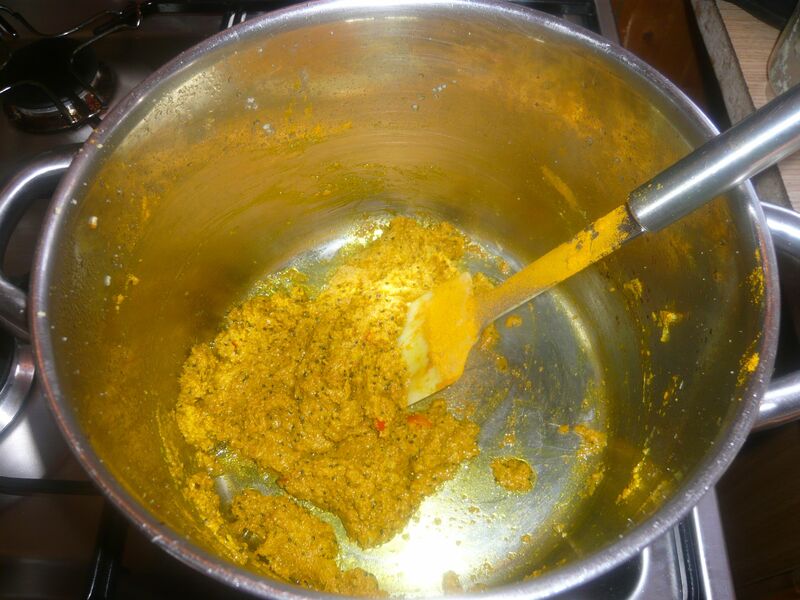 This an example of the most basic of pastes which is onion, garlic and ginger blended. You can see where the consistency of Indian and Thai curries come from when you start cooking this way. Fenugreek can be harder to find than other spices. It takes a pestle and mortar to grind it to a powder, but it does add another depth to a dish which is always good, but you can lose it. Blend or grate the onion, garlic and ginger. Peel and cut the squash into 3cm chunks. Drain the chick-peas, pick the coriander, and mix together the fenugreek, cumin and coriander. Chop the chillies and roast off the cashews. Turn the oven to 200 degrees. Toss the cubes of squash in oil, put onto a baking tray and roast off in the oven. Spread the squash out so its not heaped on top of each other. Cook until browned and soft, about twenty mins, being gentle so it doesn’t turn to mush. Meanwhile, put a pan with the oil onto a medium heat. Add a teaspoon of mustard seeds, as soon as they begin to pop add the onion, garlic and ginger. Fry off without colouring them too much. When really soft after about 5 minutes add the spice and cook some more, constantly stirring so it doesn’t take on the bottom and then take off the heat. Stir in the coconut milk, salt, sugar and chilli then return to a low heat with the chickpeas and cook for thirty minutes. Take off the heat and taste. Squeeze half of the lime and tweak as you feel necessary for salt. Don’t worry if you think the sauce could be a bit sweeter, the sweetness of the squash will come through when its all combined. Gently fold in the roasted squash, again, being careful it doesn’t turn into a mush. To serve put some steamed rice in the bowl, and ladle the curry with some sauce. Roughly crush the cashews (I use the bottom of a pan and lean on it so it breaks them up). Sprinkle a generous amount of cashews then finish with a fat pinch of picked coriander. 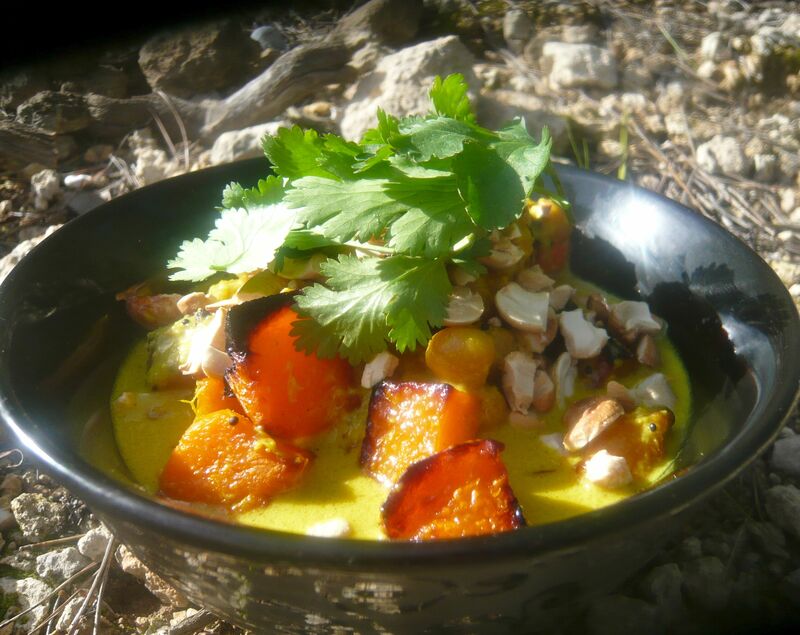 This entry was posted in Roast Butternut Squash Chickpea and Coconut Curry and tagged cashew, chickpeas, chillies, coconut, coriander, cumin, curry, fenugreek, garlic, onion, pumpkin, quick, turmeric. Bookmark the permalink. Looks great will try soon. Did the warm cauliflower salad – vg.